This title will be released on November 15, 2011. The entire text of Rulebook, supplemented with extensive further explanations and exercises. Homework exercises adapted from a wide range of arguments from newspapers, philosophical texts, literature, movies, videos, and other sources. Practical advice to help students succeed when applying the Rulebook's rules to the examples in the homework exercises. Suggestions for further practice, outlining activities that students can do by themselves or with classmates to improve their skills. Detailed instructions for in-class activities and take-home assignments designed to engage students. 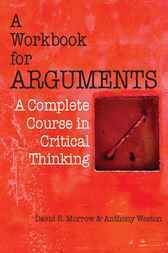 An appendix on mapping arguments, giving students a solid introduction to this vital skill in constructing complex and multi-step arguments and evaluating them. Model answers to odd-numbered problems, including commentaries on the strengths and weaknesses of selected sample answers and further discussion of some of the substantive intellectual, philosophical, or ethical issues they raise. David R. Morrow is Assistant Professor of Philosophy at the University of Alabama at Birmingham.